Are you stuck in a fitness rut after the long, rainy winter? Wondering how you can get in any decent exercise with a baby in tow? 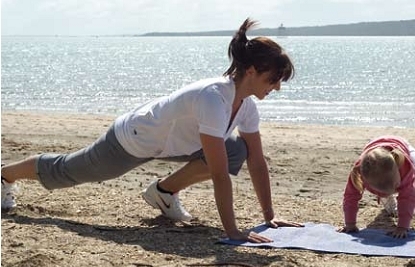 It's time to get out of the house and get fit, says fitness expert Lou James. After the wettest winter on record, you have had plenty of excuses to put off exercising. It is definitely harder to motivate yourself to get out the front door in your runners when the southerly is blowing the rain straight into your face. But with spring in the air, more sunshine and longer days ahead, now is the perfect time to dust off the exercise gear and get active outside. I believe regular physical activity is an essential component required for optimal physical health. Whether you are pregnant or a first-time mum, or whether you have a tribe of kids depending on you - being physically fit and active is vitally important to help you to cope with the stress and energy it takes being a mother! Mothers are very good at putting everyone else in the family ahead of their own physical and mental health needs. It is difficult to schedule time for your own exercise during an already very busy week. However, you must take the time to look after yourself. Do not feel guilty for making time for you! • If you are healthier and happier with yourself, then your relationships with all members of your family will benefit. • You'll be a role model for your child by demonstrating an active lifestyle. 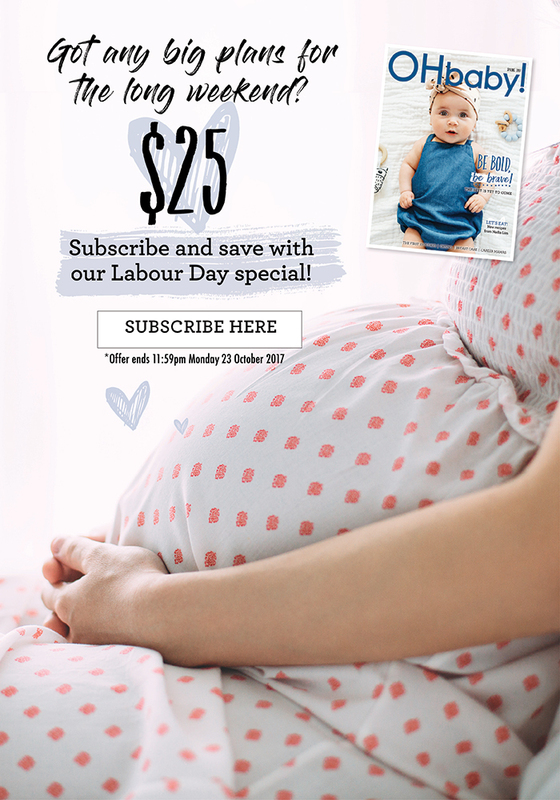 • You'll have more energy to keep up with the demands of raising children. • Regular exercise helps to reduce stress levels so you are less likely to lose your patients with your needy family members. • Exercise is also proven to help new mothers combat postnatal depression. You do not have to spend a lot of money, dedicate a huge portion of your week, find regular babysitters, or take your child to a crèche in order to exercise. With a few simple props, there are plenty of exercise options you can do with your baby or toddler in tow. Outdoor circuit-type exercises are a fantastic, time-efficient way to enhance your cardiovascular fitness and improve muscle tone and strength. Studies at Baylor University in Texas show that circuit training is the most time efficient way to enhance cardiovascular fitness, strength, flexibility and muscle endurance. Studies show that circuit training helps women to achieve their goals and maintain them longer than other forms of exercise or diet (The Cooper Institute, Texas). 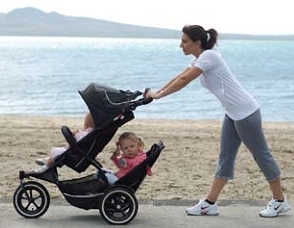 Now the weather is on the improve, strap your child into the stroller and get active. Here are some examples to help you incorporate cardiovascular, strength, toning and flexibility exercises into an outdoor circuit with your children with you. Exercise is always more fun with company, so join up with a friend and give it a go. All you need is a good pair of walking or running shoes, a bottle of water, a stroller, and a sun hat (and maybe snacks to bribe your child). A resistance band and towel are optional. Start off with 15-20 minutes of power walking in a relatively flat area to warm up. • Concentrating on your posture and form while you are walking will help to ensure your core abdominal muscles are switched on and help to tone this area while you are striding out. • Stand up tall, shoulders back, draw your lower abdominal muscles in and up. 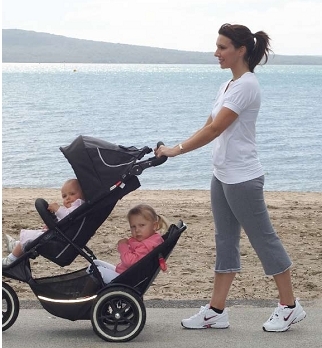 • Keep your arms and shoulders relaxed as you push the stroller. This exercise is great for toning your hips, thighs and calf muscles and improving your cardiovascular system. Find a sturdy park bench, put the brakes on your stroller, and get your heart rate pumping by doing step-ups. Start with 10 step-ups, leading with your right leg, followed by 10 step-ups leading with your left leg. Rest for approximately two minutes or until you get your breath back, and repeat the set again. • You can do a high- or low-impact option for step-ups, depending on your fitness level and the health of your leg joints. For the low-impact version, just walk through the step-up motion onto the bench. For the high-impact option, spring up and down from the bench in a running action. • Keep your posture upright. • For the high-impact option make sure you bend your knees fully as you land to lesson the stress on your leg joints. Most children are very happy to watch their mummies exercise in front of them, if you don't stop for too long. 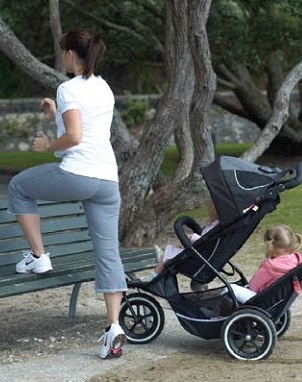 When you have finished your step-up sets, get the stroller moving again by power-walking to your next stop. It is totally up to you how long you power-walk between sets, but I recommend about five minutes between each set. 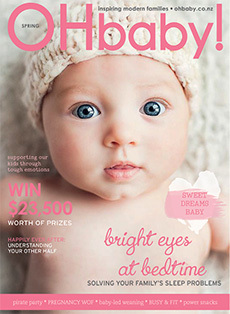 If you are trying to get your wee one to drift off to sleep, feel free to keep moving a bit longer between stops. This is a great strength exercise for toning your arms. Find a park bench, and place your hands on the bench with your legs bent in front of you. Bend your elbows so you lower yourself towards the ground, then repeat slowly 10 times. Have a break, then repeat for another five to 10 reps.
• If you find this exercise is too hard on your wrists and arms, then you will need to get a resistance band and do a modified version. Your local physiotherapist will have a supply of resistance or theraband you can purchase for very little cash. • Here's how to do a modified tricep exercise with resistance band. Hold the band in both hands behind your back, with your elbows bent. Stretch both arms straight at the same time. Repeat 10 times, then switch band to opposite hands. This exercise is great for toning and strengthening your hips and thighs. Stand with your hands on your stroller, take a big lunge forward with your right leg, bend both legs, and push your stroller forward. Your left knee should be near the ground. Engage your abdominal and hip muscles to push up back to the starting position. Next, take a big stride with your left leg forward. Repeat on both sides until you have done 10 repetitions. • Form is very important during lunges. It is important that your do a big stride and that your watch your knee alignment. Your knee should bend directly over your ankle and not roll inwards. • This is a great exercise for toning your hips, so make sure you use your hips to help you push back up from each lunge. This is excellent for strengthening your abdominal muscles. 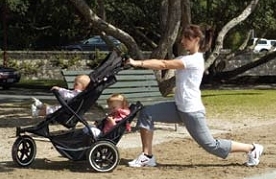 You may to pop a towel into the bottom of your stroller for this exercise if the ground is a bit wet. This exercise is also a chance to get your baby or toddler out of the stroller. You can hold your baby while doing this exercise. Sitting on the ground with your knees bent in front of you. With your arms out in front of you (holding onto your baby optional). Roll slowly down through your lower spine until your back is curved like a C-shape. Draw your lower abdominal muscles in as you slowly roll up again. Repeat 10 times. • Form is very important during roll-downs. Make sure you focus on drawing your abdominal in towards your spine rather than pushing them out. • This exercise should not strain your back. Make sure you are rolling down through your spine and hinging with a flat back. This exercise strengthens your arm and leg muscles and is great for your hip and hamstring flexibility. Your toddler will love to copy you doing this exercise, or you can lay your baby in front of you while you work out. Place your hands on the ground directly below your shoulders. Stretch one leg back, straight, with your weight on your toes. Bend your opposite leg up underneath you, so that your foot is under your chest. Jump your front leg back and your back leg forward. Repeat 20 times. • Engage your lower abdominal muscles while doing this exercise. • Try and take the biggest strides that you can, stretching your leg muscles with each stride. It is important to conduct a cool-down period at the end of your session, and the best way to do this is to walk for 5 to 10 minutes after your last set of exercises. Stretching is also important - take the time now to stretch out your hamstring, calf, and thigh muscles in particular. Technique is paramount. How you do an exercise is just as important as what you do. Make sure you position your body appropriately for each exercise and control each movement. Listen to your body - if a particular exercise is painful beyond what you would expected or causes swelling, stop doing it. If pain persists, make sure you get your injury looked at by a physiotherapist or doctor.